Are Army Recruits Poor and Dumb? The Republicans are having fun beating on John Kerry again. The stated reason for their anger is that Kerry implied only the lazy and uneducated dregs of society go into the military. The real reason for their focus on Kerry is that he was such a terrible, weak candidate last time around, they would love to run against him again, rather than whomever they are actually facing in their Congressional races this year. I do think Kerry's remark betrayed a general liberal assumption that the army is made up mainly of uneducated southern rednecks and poor urban blacks. Its hard to get an exact demographic handle on this, because the army does not really ask how much money your parents make when they recruit you. 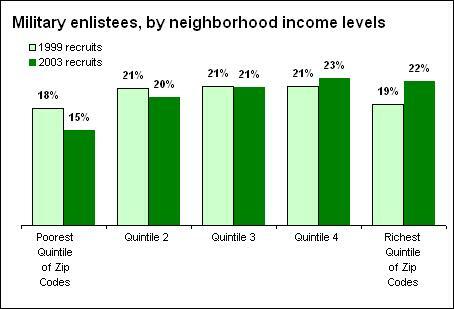 However, they do ask you what zip code you are from, and this analysis seems to belie the common liberal assumption, showing the army is actually made up disproportionately of recruits from the richest rather than the poorest zip codes. More on this analysis here. I suppose a large number of Americans must support the free speech restrictions embodied in McCain-Feingold and other campaign finance laws, or they wouldn't have passed. The logic of such laws is apparently to reduce the influence of "big-monied interests" in elections, I suppose by being able to saturate media with their point of view. So here is my question - have you ever met anyone (other than John Kerry with his Iraq vote) who thought that they had been duped or unduly influenced by election advertising? Have you met anyone who says "yep, I voted for the guy with the most ads instead of what I believed in?" The fact is that I have never met such a person, even among those who support campaign speech restrictions. Their position is always that they are of course too smart to be gulled by the ads but "a lot of other people are not as smart". But who are these other people? They are like the friend of a friend who swears his grandmother put her cat in the microwave to dry it off. They don't exist. The fact is that no one thinks that they personally are unduly influenced by campaign ads, but they think everyone else is. Here is a rule of thumb: When supporters of a law take the position that "This law is not necessary for me but for all those people who are not as smart as I am", it is a bad law. people live down here than did back during the Nixon administration. Southerners, come join Arizona on the "dark" side of this issue. Arizona decided long ago that it had plenty of daylight, did not need to save it, and therefore was not going to play with the other kids. We sometimes catch some grief for being out of step, but you don't see any of us scrambling around the house twice a year looking for our VCR manual to figure out how to change the clock. I am willing to make a bet. I will bet that at least 90% and probably 100% of US Senators have money invested in equities. Why? Because, for long term investments, you would be insane not too. Even with substantial drops in the market form time to time, equities outperform bonds and government securities by miles and miles. From this chart, you can see that even if you had the misfortune at age 30 to invest all you savings in stocks the day before the 1929 stock market crash, you STILL would be better off by age 45 having invested in stocks than bonds and your investment would be worth 10 times more at age 65 than if it had been in bonds. And remember, that is the case of investing on the worst possible day of the last century. Any other comparison is even more favorable for stocks. The difference in wealth between stocks and government securities at retirement age is staggering. Any financial adviser who told a person under 50 saving for retirement not to invest some of their money in stocks should be fired on the spot for malpractice. On the issue of privatization, I had some time ago considered an idea to place a relatively small portion of benefits in an investment account, providing that the "security" aspect of Social Security was retained and the investment was under professional management. However, with the severe fluctuations of the stock market, I have since rejected that idea. Men like John Kerry get most of their wealth from stocks, and would fire any financial adviser who did not invest a good portion of his wealth in equities. He understands that stocks will fluctuate from time to time, but that over decades (which is how one invests for retirement) they are the best choice. How hypocritical is it that he and others are saying "Stocks are great for me, they make me wealthy, but trust me, they're not right for you". More on distrust of individual decision-making here.